Mahalaya occurs on an Amavasya, the last day of the dark fortnight (Krishnapaksha) in the month of Ashvin, according to the Hindu lunar calendar. Mahalaya marks the beginning of the annual Durga Puja festival. On this day, Goddess Durga is believed to descend on Earth, her ‘paternal home’, every year. The Krishnapaksha in the month of Ashvin is also observed as Pitripaksha, which literally means ‘the fortnight of the forefathers’ — a 16-day period when Hindus pay homage to their ancestors. Mahalaya marks the end of this Pitripaksha. On this day believers perform a ritual called Tarpan — an offering made to the ancestors. They take a holy dip in the Ganga or other rivers and water bodies before performing Tarpan. Krishnapaksha then makes way for Shuklapaksha, the brighter fortnight, which in this month is celebrated as Devipaksha. These two contrasting periods of Pitripaksha and Devipaksha juxtapose to create the pious moment of Mahalaya. On this day, sculptors making Durga idols start painting the eyes of the Mother Goddess, and the special ritual is called ‘Chakkhudaan’. After the Chakkhudaan, the Goddess is asked to wake up and open her eyes. In Bengal, where Durga Puja is the biggest festival, Mahalaya holds a special significance. Bengalis, irrespective of age, social status, gender, belief and political leanings wake up before dawn to welcome the ‘homecoming’ of Mother Durga and her children – Lakshmi, Saraswati, Kartik and Ganesh. Listening to the Mahishasuramardini composition, which combines a narration, hymns and devotional songs describing the creation of Goddess Durga to kill the evil Mahishasur, is a ritual Bengal and Bengalis have followed for more than 85 years now. Composed in 1931, the Chandipath by legendary Birendra Krishna Bhadra and the devotional songs by celebrated artistes have retained their charm till date. 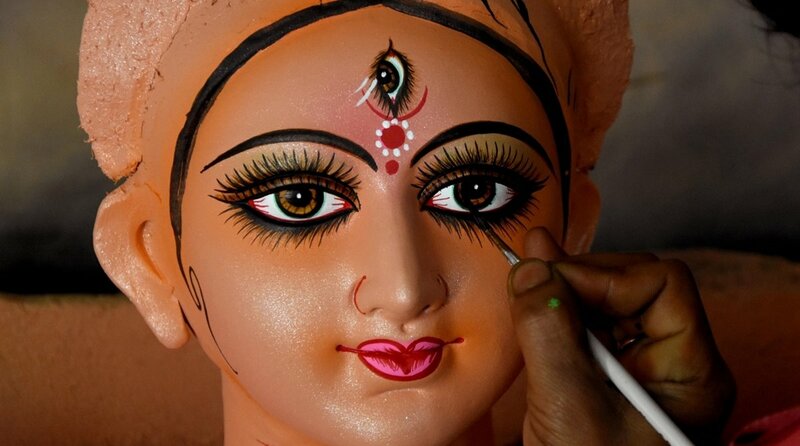 For Bengalis, Mahalaya is synonymous to Mahishasuramardini. A recorded version is played by radio stations at the crack of dawn, and people listen in rapt attention in an emotionally charged ambiance. The 15 days of Devipaksha ends with Kojaguri Purnima, the full moon night when Goddess Lakshmi is worshipped in Bengali households. Durga Puja celebrates the victory of Goddess Durga over Mahishasura, the buffalo demon. Though the rituals of Durga Puja start with Mahalaya, the main festival begins on Mahashasthi, the sixth day of Debipaksha. This year, Mahashasthi will be on 15 October, followed by Mahasaptami on 16 October, Mahaashtami on 17 October, Mahanavami on 18 October and Vijayadashami or Dussehra on 19 October, Friday.